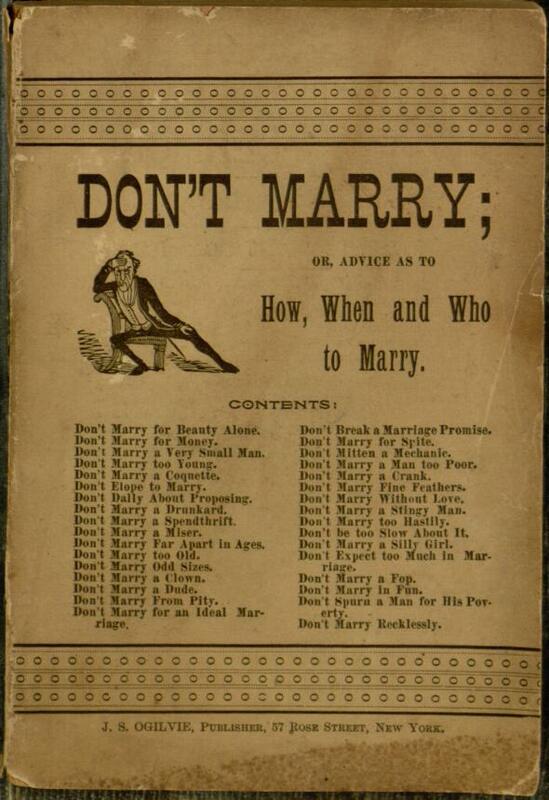 History of marriage advice: A late-19th-century dime novel explaining when not to get married. This fun book, which offered young lovers advice on wise courtship, was one of a series of dime novels printed and sold cheaply in New York City by the J.S. Ogilvie Publishing Company in the late 19th century. It’s recently been digitized by Villanova University’s Falvey Memorial Library. The 112-page book, which I’ve embedded below, can also be read on Villanova’s website—and I recommend the experience. Here are some highlights. Don’t marry somebody whose character you have not investigated: Many, Hildreth writes, “marry and risk a life-long happiness on less actual information of each other’s real nature than a good horseman would exact of his carriage horse’s pedigree. This may do in the country, but never will answer in a city.” Prospective spouses needed to ask questions.